Take a Pumpkin Picking Ride to the field to pick your own pumpkin on Saturdays 11-5 and Sundays 12-5 in October to pick your own pumpkin! Cost is $6 per person. We have many nice pumpkins in the field! Pumpkin Picking Rides- take a wagon ride to the field and choose your own pumpkin on Saturdays 11-5 and Sundays 12:00- 5:00 in October. Charge is $6 per person and includes the pumpkin. Corn Maze- Take a stroll through the maze and find your way through twists and turns. This maze is geared for people of all ages. It provides a challenge but is not so big that you are there for hours. Per person charge is $3. Caterpillar Crawl- Crawl or walk on our long row of round haybales and slide down the side. Haystack- a place for kids of all ages to play in the straw. Graffiti Barn Wall- Where else can you draw on the wall? Use your creativity and draw or write on our chalkboard wall. Leave your favorite thoughts of the fall or draw your favorite thing about the farm. Photo Frames and Fun straw bales- Bring your camera and snap a picture in our fun frames and with our decorated bales. Animals- We have cattle and there is always a cat around the farm. We do not have a petting environment you see the animals in a farm atmosphere. Eilenfeld Concessions will be providing food service to our guests the last weekend in September and Saturdays and Sundays in October. They will have cider slushies, brats, hotdogs, shredded chicken and pulled pork, polish sausage, dipping donuts, kettle corn, nachos and much more. 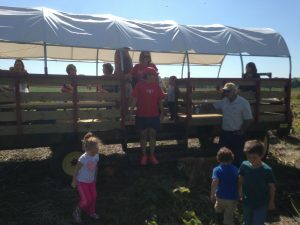 Pumpkin Picking Rides - Bring your group for a hay wagon ride to the field to choose your own pumpkin. Or combine a pumpkin picking ride with a campfire for your church group, family get-together or birthday party. Reservations, a 20 person minimum, and a $20 deposit are required. 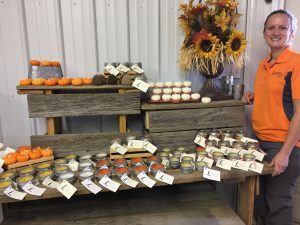 Campfire, pumpkin picking ride and maze combination has a $10 per person charge. Campfire site includes picnic tables and fire prepared before your arrival. Bring your own marshmallows and sticks and enjoy an evening under the stars along Deer Creek. Rent the Barn- Reserve a place out of the weather for your group. Includes picnic tables for your group size $100. Deposit of $50 required. School Groups - Bring the class for the day and learn about the crops and livestock we raise and about how farms touch your life. 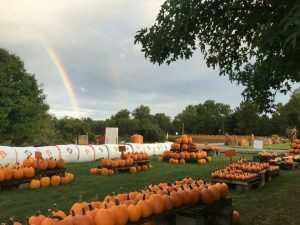 We include a pumpkin, play in our haystack, crawl on the hay caterpillar, drawing on the graffiti wall as well as a trip through the corn maze. 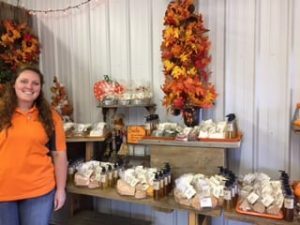 Pack your lunch and have your fall field trip at Lohstroh’s. Call for details. Minimum size will be needed to schedule. Cost is $6 per person. Enjoying the nice day...so far. Field dinner, now more hay wrapping. Electric upgrade today for the farm.